Arriving at a destination off season when nothing is open or choosing the same week as everyone else to escape to one secluded location can ruin a holiday. It's the perennial dilemma for all fans of travel - where to go when. You don't want your sight-seeing culture break to be overshadowed by sweltering heat or to miss seeing your favourite animal on safari due to migration. With this in mind, Lonely Planet has released an invaluable new book, Where To Go When, packed with inspiring photos, expert insight, activity ideas and infographics on climate, transport, budget and attraction highlights for planning a trip every month of the year based on your interests. Read on for some of the monthly highlights. 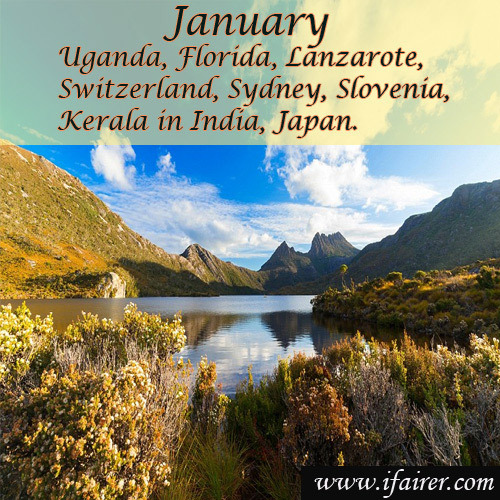 The destinations that Lonely Planet recommends travellers head to in January include Uganda, Florida, Lanzarote, Switzerland, Sydney, Slovenia, Kerala in India, Grenada, Honshu in Japan, Guatemala and the Arctic Peninsula. This month is also the time for nature fans to visit the southern Serengeti in Tanzania to watch thousands of grazing wildebeest or to explore the empty beaches and nature trails in full bloom in Australia's Tasmania. Other highlights this month include the Hay literary festival in Colombia, cruising through Myanmar under a balmy sun and taking in Vienna's glamorous winter balls.